Thermwood's Award Winning Cut Center is an exciting alternative to traditional CNC routers - just tell the machine what you what to make and it does it...it is that simple! No programming is required! Also, you can operate the system as a CNC router in the traditional manner, running programs generated with virtually any CNC software. 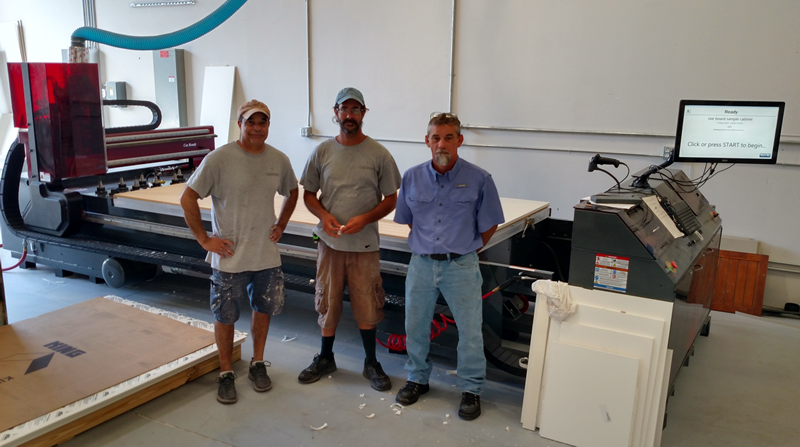 Here we present a short video featuring a new Thermwood Cut Center owner and their impressions of the machine and its capabilities. Take a listen to Tim Richardson of Timberwood Properties in Leesburg, FL as he discusses their new Cut Center and what the machine is doing for their business. Below are a few more Cut Center owner impressions as well - take a listen to Aaron Barlow of Original Woodworking in Bluffdale, UT, Michael Bednark of Bednark Inc. in Brooklyn, NY, John Allan of Arkansas Wood Doors in Pottsville, AR and Donovan Mumma of Byrne Custom Woodworking in Lenexa, KS as they discuss their new Cut Centers and what the machine is going to do for each business.